External monitoring now supports HTTP methods other than GET・mkr graph annotation support etc. Signs of Spring are starting to show and with this season, comes the anxiety of allergies… It might be interesting to use Mackerel to try and monitor the amount of pollen spreading. Here is this week’s update information. We’ve expanded the types of HTTP methods available for external monitoring. The available methods are: GET POST PUT and DELETE . Additionally, it is now possible to specify the accompanying request body. This makes it possible to monitor various APIs from methods other than GET and allows for more versatile external monitoring. When a large amount of logs are recorded by check monitoring etc. in alert details, pagination can now be done to the history. 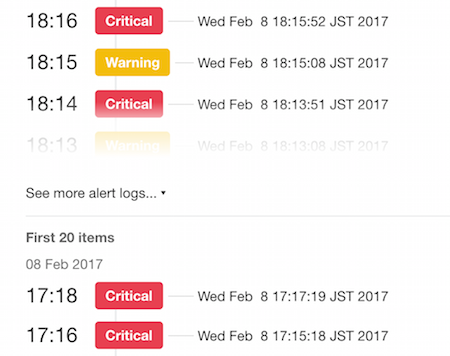 The most recent history along with the first 20 events since the alert occurred are displayed in first view, making it easier to grasp the details of alerts with long history. The recently released graph annotations are now supported in mkr. Use the subcommand mkr annotations. % mkr annotations create --service My-Machine --from 1480125301 --to 1486125301 --title "Deploy"